Last year, I randomly stumbled on Baum’s Christmas trees. Then Saturday, Laura and I made visiting Baum’s a tradition when we picked up our second tree in as many years. And personally, I think the tree we bought this year is the best one we’ve found since we’ve been together. Baum’s Christmas tree stand, which is located in a front yard in the hills behind DI. I’ve included my original post in its entirety below. To that I’ll just add that while Baum’s may not be the only family-run Christmas tree operation out there, it’s still a fairly unique place where you can talk to the actual person who cut the tree down. And while the trees themselves may not be local, the rest of the operation is so it’s better for the local economy. As a result, I once again highly recommend Baum’s. Since my original post, Baum’s has also been featured in a Daily Herald article, which includes more information. If you’re looking for a Christmas Tree in Utah Valley, allow me to recommend Baum Christmas Trees. It’s a Christmas tree lot located in Mr. Baum’s front yard, at 1650 N. 1250 W. To get there, head north along the street behind D.I., turn left at the first light, follow the road as it curves around, and turn right at the appropriate street (first or second street you come to). Baum Christmas Trees is charming and quaint in a way that parking lot venders never could be. Not only are you walking around on someone’s front yard, but there’s one of those little, pre-fab waterfalls. Also, the Baum family is very appropriately named, as “baum” means “tree” in German. According to Mr. Baum — I didn’t get his first name, though the tag on our tree says R. Ladell Baum — he cuts all the trees himself, mostly in Utah and Wyoming. His son told us that the family has been doing it for 40 years, and used to sell about 2,000 trees. Today, they sell around 1,000. And lest you think that this place is too Mom and Pop to have a decent selection, I assure you that there are trees for all tastes. We got a $28 tree that is probably just under 6 feet. There were a lot of taller trees and some smaller trees. They come in all the typical breeds (species? varieties? what do you call different types of pine trees? ), and can be flocked as well. As for us, we’re both pleased with the tree we found and are glad we accidentally stumbled upon Baum’s while driving around one day. This week kicks off the most intense shopping season of the year. It’s a fun and kind of stressful time that pours a massive amount of money into the economy. But how much of that spending is at locally owned businesses? 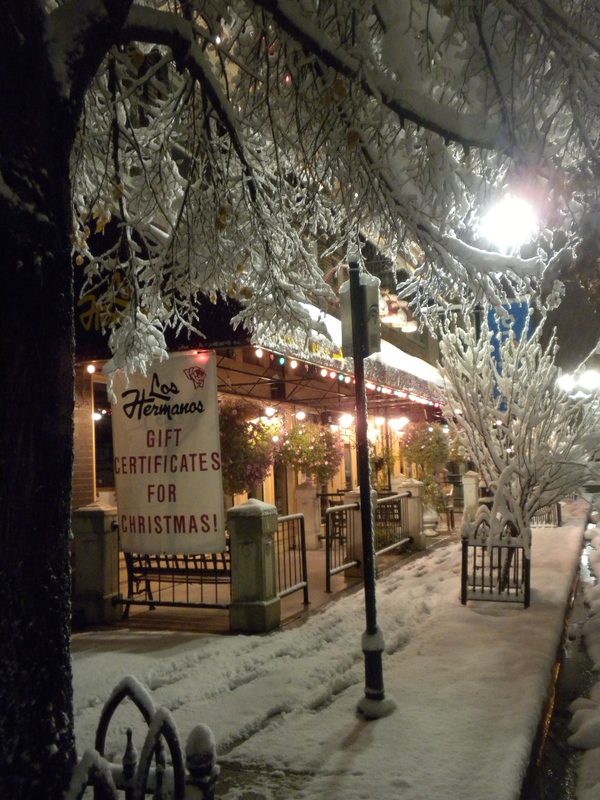 A banner advertising gift certificates at locally-owned restaurant Los Hermanos. Most local restaurants have similar offers, which is just one possible way to do holiday gift shopping locally. And keep in mind, this doesn’t mean a radical change to exclusively shopping at local businesses; rather these impacts would be realized with a relatively measly 10 percent shift. To that I’d add that shopping locally can be more fun and less stressful because it’s inherently close to home and because it often results in more unique purchases. I’ve written before about the benefits of shopping locally, but there’s never been a better time to start than during the holiday season when we’re all (supposed to be) thinking about trying to be just a little bit better. 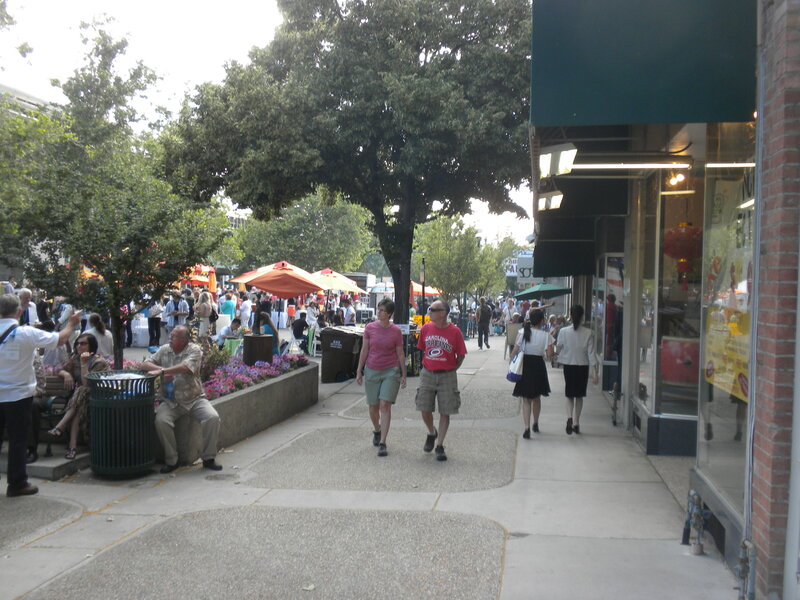 Historic downtown Provo encompasses 35 blocks and contains more than 150 retail stores, 39 restaurants and several government and private offices. 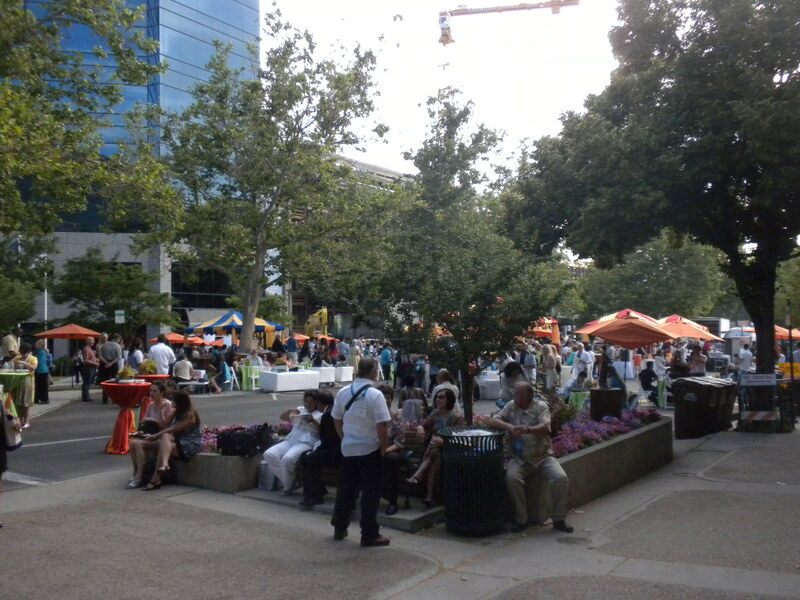 In addition, many consider the Covey Center for the Arts and farmers market among the district’s top assets. Turn-of-the-century street lighting and traffic signals add to the historical ambiance that visitors and residents embrace. This is news great for Provo, but what does it actually mean? 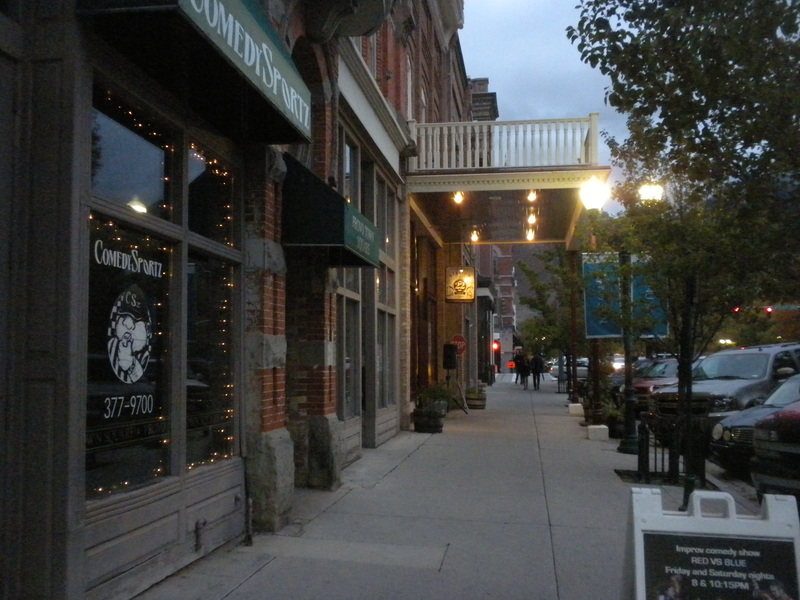 Restaurants and a comedy club on Center Street. Among the obvious lessons about the importance of preserving historic architecture, improving walkability, and investing in growth, I think there may be another more important point: uniqueness and local loyalty pay off. Consider: of all the restaurants in downtown, every single one is independent; all of the entertainment venues specialize in local performances; even much of the historic architecture was designed, out of necessity, by a local architect. There are hundreds of “quaint, village-like” downtowns in the U.S. Many of those downtowns are great too. But a city doesn’t rise to the top of the pack by slavishly copying other cities; it rises to the top by developing a unique character that can’t be found anywhere else. Stores, restaurants and an art installation. 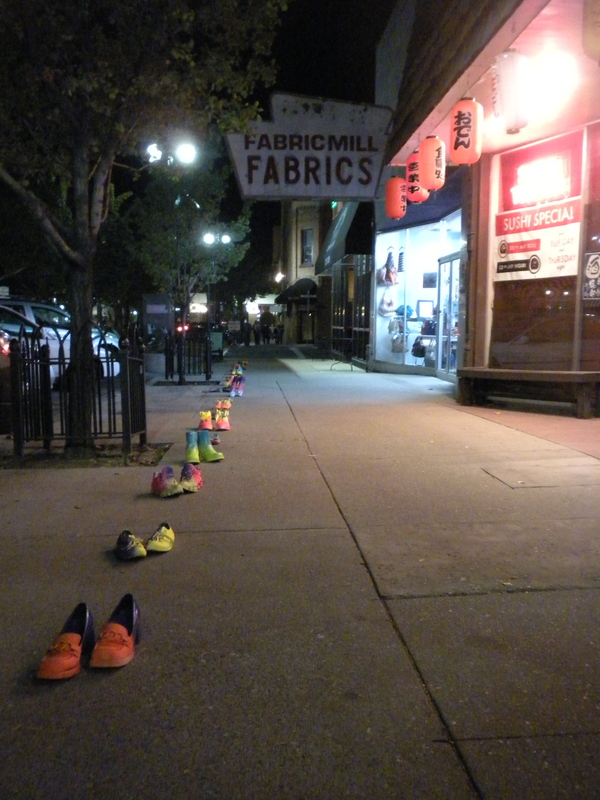 When was the last time you saw guerrilla art outside a chain restaurant or strip mall? For me, the answer is never. As I write this post, I’m thinking in part of conversations happening on the Keep Downtown Independent Facebook page. Those conversations mirror many others going on in Provo and elsewhere about the relationships of local and non-local business. But this much is apparent: 1) Provo’s downtown is being recognized as among the best of the best; 2) it also has very few non-local businesses; and 3) that lack of chains is atypical, in my limited experience, for a downtown. The logical conclusion from those three points is that downtown Provo’s unique, local business composition has something to do with its growing success. It follows then that bolstering that composition would increase success, while compromising it would jeopardize success. I don’t have a conclusive argument to make on this subject and I tend to shy away from any one-size-fits all solution. But as the city moves forward it’s my hope that it becomes more unique and less like the many other downtowns that it has already surpassed. Station 22 and owner Richard Gregory are among the leaders in the effort to make downtown Provo a wonderful and unique place. In fact, Richard is even the founder of the Keep Downtown Independent Facebook page. So I think it’s worth mentioning here that tonight Station 22 is having its grand reopening. The restaurant has been closed for renovations recently, but is ready to celebrate with food, music, and prizes. Station 22 is celebrating its grand reopening tonight with a party. The restaurant will also open with a few changes. I peeked in the back window the other day and saw some physical alterations to the space itself, but probably the most notable difference is that the restaurant will now be a full service establishment. Previously it fell into what might be described as the “fast casual” genre, though that description doesn’t really do it justice. In any case, Station 22 has done great things in the past so it’ll definitely be interesting to see what they do in the future. When I was growing up, my dad told me several times that I should go visit Stan’s Guitar Shop. The store was about a mile or so from my house and was a tiny space that specialized in bluesy rock. Filled with history and atmosphere, it was the kind of place that every town needs but few actually have. Or, at least, that’s what I was told. The truth is I never got around to visiting Stan’s. I was a teenager with other things on my mind and though I loved music I thought I had all the time in the world. I didn’t, of course, and even before I moved away for college the shop closed forever. I’ll never really know what I missed. Running a retail business has only become more difficult in the years since Stan’s closed and the mom-and-pop shops that have survived through Herculean efforts add something irreplaceable to the community. As I’ve written many times on this blog, they circulate more money back into the local economy than larger chains. Perhaps more importantly, they provide crucial gathering points, unique services, and “experiential shopping” in which buying something becomes more about exploration. The Great Salt Lake Guitar Company in downtown is exactly that kind of store. Located on Center Street, it’s both a workshop and retail space. Among other things, the family-run shop sells hand made guitars, hosts shows, and (as I can attest) offers free advice. It’s a remarkable place to have anywhere, and it’s one worth fighting for. As I learned years ago from Stan’s, a city’s retail community is neither static nor immune to difficulty. I also learned that it’s important not to postpone visiting these kinds of businesses; if everyone shares that attitude they die, as Stan’s did. 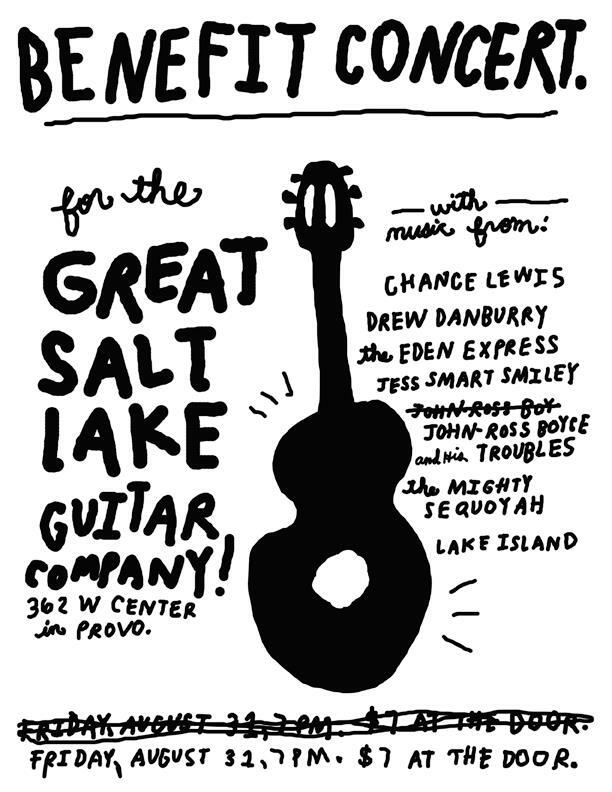 Along those lines, the Provo community will have an opportunity to experience and support The Great Salt Lake Guitar Company tonight during a benefit concert. Truth be told, I don’t know a lot about this show, other than that it has a great lineup. But that’s almost beside the point. Ultimately, the great thing about this show is that it gives us a chance to support an amazing business now and help ensure that it’s around in the future. Before I even realized it, June ended and July was nearly a third gone. Nevertheless, as is the tradition on this blog, I wanted to highlight my favorite posts from the month that brings us Father’s Day and the beginning of summer. The Copenhagen Denmark LDS Temple: A Case Study: The LDS Church is preparing to build a temple in downtown Provo. Though the church often chooses a decidedly (and unfortunately) suburban plan when building temples, the church’s facility in Copenhagen shows how urban temples can work remarkably well with their surroundings. Daybreak: A Case Study and Conclusions: This pair of posts looks at the shiny new housing development in West Jordan for examples of Utah’s more cutting edge urban design. Ultimately, these posts posit that while the development does some things well, its location and lack of things like walkability dooms it to being just another suburb. Why Everyone Should Buy Local: This post points out that buying from local businesses provides a better customer experience and benefits the local economy to boot. “Turn Off the Lights,” Or, How We Waste Resources: In this post, I draw an analogy between underused parking lots and leaving the lights on in your house when no one is using them. The objective here is to use a commonly understood activity — turning off the lights — to understand how parking is vastly overbuilt and underused. The Original Provo Tabernacle is Now a Garage on 500 North: Before Provo’s current LDS tabernacle was built, the city had an even older building. That building was demolished in 1919, but the stones were reused in a residential garage on 500 West. This post includes pictures of the recycled stones. Attitudes in Provo toward Nu Skin vary from hostility to love and I’m not sure either side realizes just how strongly the other feels. Attendees to a Nu Skin leadership conference in downtown Provo. Note that many of the people in this picture have shopping bags. It’s a shame downtown Provo didn’t have more shopping opportunities for these people. 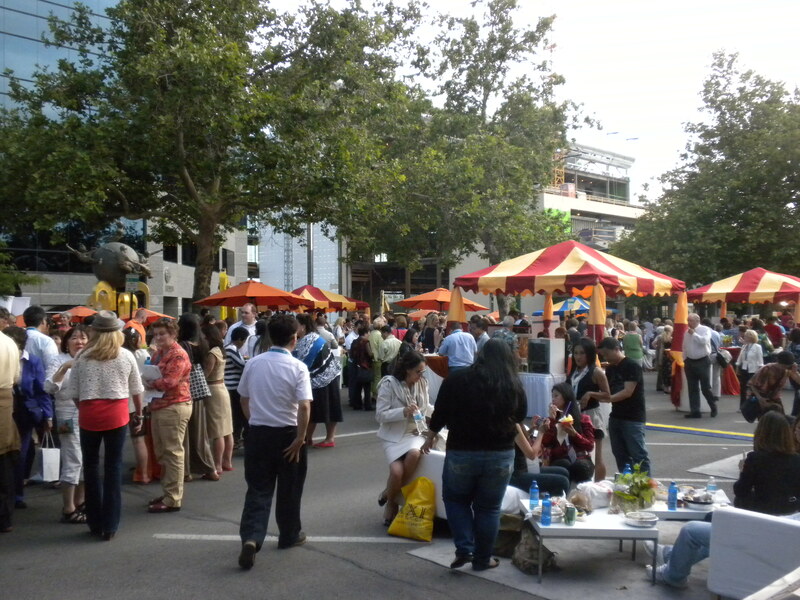 This event sent people spilling over into many downtown restaurants. It’s easy to see Nu Skin’s impact on Provo when looking at the changing skyline. That’s a change some people like and others don’t. But it’s important to remember that events like these — which are easy to overlook and harder to quantify — offer an infusion of outsider money into the local economy. While walking around this event, for example, I saw people with Nu Skin name tags in most of the restaurants between University Ave and Center Street. Others carried shopping bags. That helps those restaurants and shops thrive, which in turn benefits locals who end up with more options even when the influx of visitors subsides. In other words, Nu Skin helps make tourism a force in Provo’s economy and for that reason, I have tremendous appreciation for the company.